Did you know that 2019 is the year of the dahlia? These beautiful, daisy-like flowers bloom from midsummer all the way to the end of fall, or through the first frost. 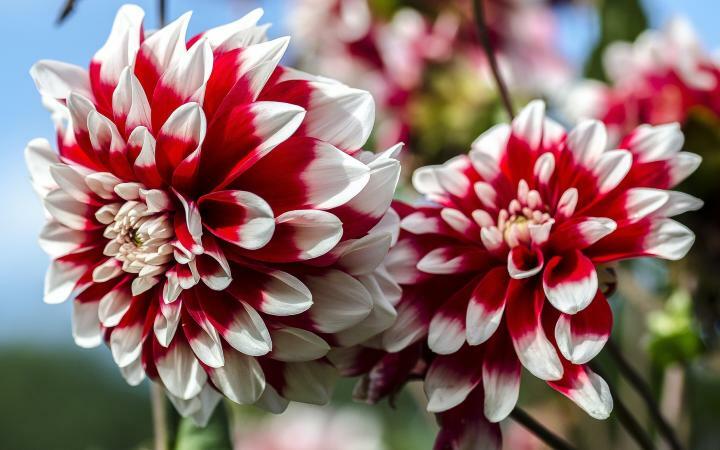 Planting dahlia bulbs is fairly easy, and you’ll be amazed at the showstopping blooms you’ll see at the end of spring! These biennial tubers are planted in the spring and belong to the Asteraceae family which include sunflowers and daisies. Choosing which variety of dahlia flower you plant can be a little daunting as there are so many! They come in a large variety of colors as well as sizes, ranging from tiny 2-inch blooms to large, 15 inch diameter flowers and reaching up to 5-6 feet in height! Keep reading this guide on planting dahlia bulbs and learn how to grow and care for the flower of the year! Dahlias are classified as tender perennials in cold regions of North America. These plants are only winter hardy is USDA zones 8 to 11. Those in zones 2 to 7 can plant dahlias in the spring and dig them up before the first frost. 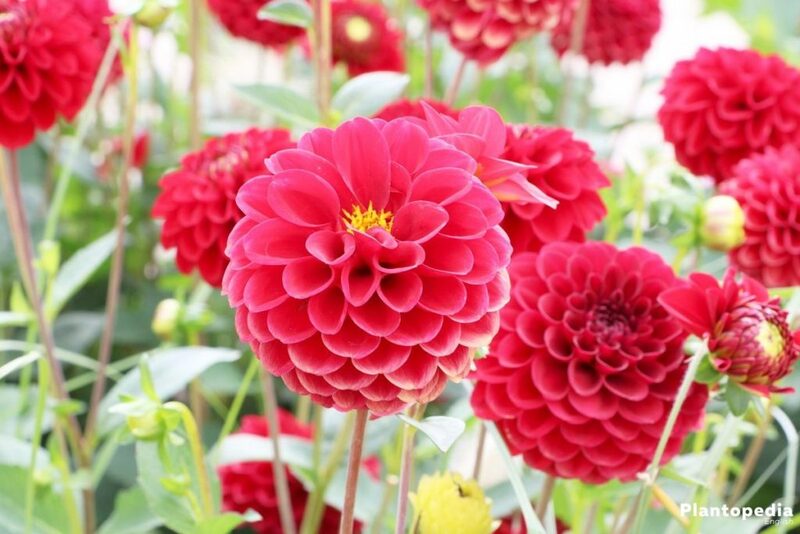 Plant dahlias in moist, moderate climates, and don’t fare well in hot and tropical climates. Don’t plant dahlia bulbs too early – they don’t fare well in cold soil. Wait until the temperature of the soil has reached at least 60F. 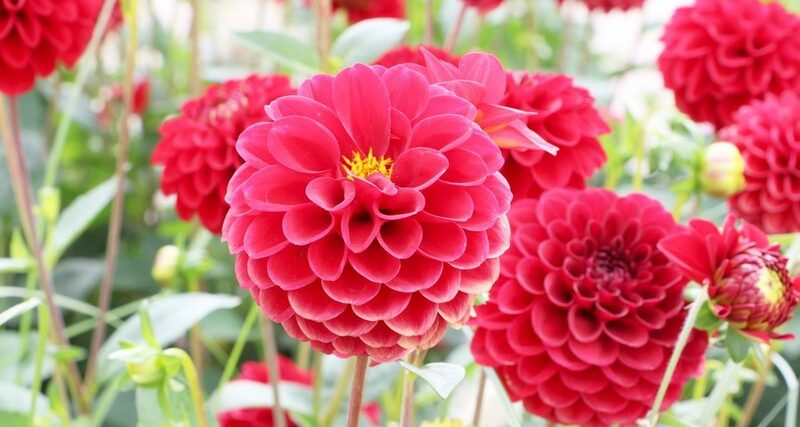 Plant dahlias in an area with full sun (preferably morning sun). Plant them in rich, well drained soil. The pH should be 6.5-7.0 – slightly acidic. Bedding dahlias should be planted 9 to 12 inches apart, while smaller varieties should be spaced 3 feet apart. The planting hole should be a little bit larger than the root ball. When planting, amend with a little bit of compost or bonemeal. Do not fertilize during planting time. The hole should be 6-8 inches deep. Set the tubers in with the “eyes” facing up and cover with 2-3 inches of soil. As the stems sprout, cover with soil until it reaches ground level. Taller dahlia varieties will need stake support. Dahlias will start blooming after about 8 weeks from planting. You can also start dahlias indoors and then transplant outdoors once the weather permits. Do not water the tubers immediately after planting – this will encourage root rot. Wait until the sprouts have appeared to water. Once dahlias are well established, water deeply 2-3 times a week for at least 30 minutes using a sprinkler. Do not mulch around the plants – it will bring in slugs and prevent the sun from getting to the roots. Did you know that both dahlia flowers and tubers are dibles?!? The tubers actually taste like a cross between a potato and a radish. 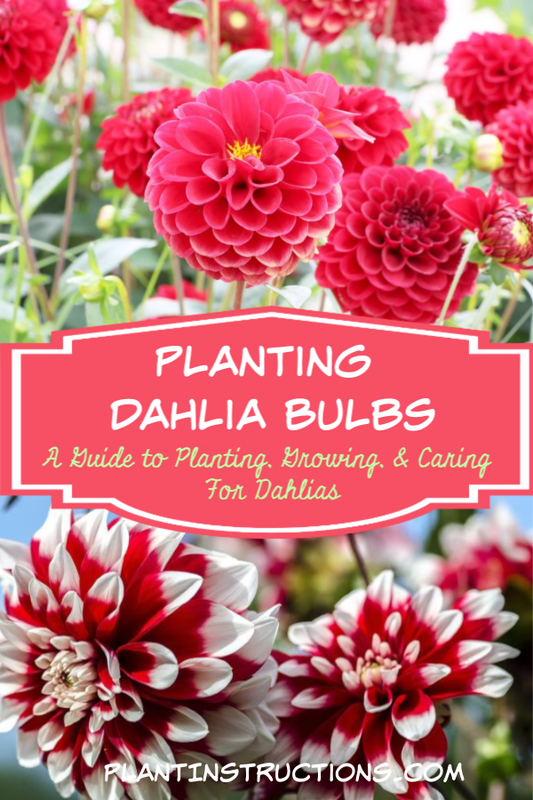 Planting Dahlia Bulbs: How to Grow and Care for Dahlia Flowers was last modified: February 8th, 2019 by Aniela M.